Curiosity may have killed the cat, but it also spawned the vCAT, VMware's set of documents for helping VMware admins tackle cloud infrastructures. The set of documents comprising the VMware vCloud Architecture Toolkit helps users turn the VMware vCloud Suite into a working private or public cloud infrastructure. The free resource guide is for anyone going down the vCloud path. VMware vCloud Suite is not for the typical small or medium-sized business. If you support a large enterprise or service provider that wants to create private and public clouds, consider vCloud. The VMware vCloud Suite is a complex mix of products, some more familiar to VMware admins than others. It includes vSphere, vCenter and vCloud Director, vCloud Networking and Security, Site Recovery Manager and -- in some cases -- management tools like vCenter Operations Manager, vFabric Application Director, VMware Chargeback and others. To test the waters with vCloud, admins can build a vCloud lab, even with a virtual lab setup. The suite's growing complexity challenges any implementer, including VMware's Professional Services Organization, which needed best practices for designing, operating and consuming complex cloud infrastructures. Any vCloud designer or administrator can make his or her job easier by relying on the VMware vCloud Architecture Toolkit (vCAT). VMware vCAT serves cloud planners, architects, builders, operators and even cloud consumers. Its major sections cover architecting, operating and consuming a VMware vCloud. VMware vCAT includes vCloud service definitions, implementation examples, workflow examples, software tools and information on cloud bursting. With more than 600 pages, the vCAT is a daunting document. It can be a challenge to know where to find what you need. But, the lengthy guide's quality overviews, document maps, reading guidelines and related organizational cues make it navigable. Getting a copy of the VMware architecture toolkit is as easy as filling out a short form, giving your name and email address, then downloading it in whatever format best suits your style. Choose a Web (mobile-capable) version, a ~42 MB zip file with a VMware documentation center package that contains all the PDF docs and other deliverables, or one large (~24 MB) PDF. The Web version looks great on an iPhone. I am told that VMware Press, a publishing alliance between Pearson and VMware, will publish the VMware vCAT version 3.1 as a printed book for purchase. VMware vCAT 3.1 debuted at VMware Partner Exchange 2013. It adds information about vCenter Chargeback and vCloud Connector and how they relate to vCloud Director. The update brought in two different video sets related to vCloud: executive and subject matter expert (SME) videos. For visual learners like me, this is a great addition to the vCAT. 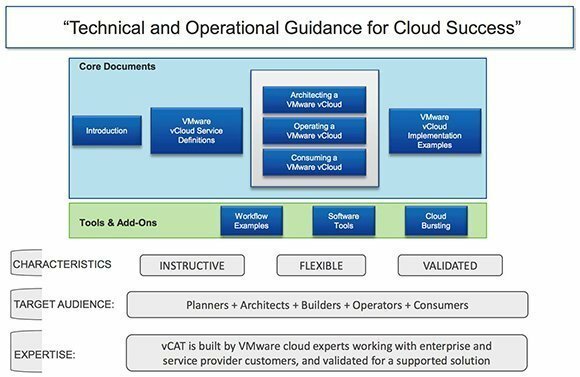 The short executive videos -- from VMware CEO Pat Gelsinger, vCloud technical marketing director Bogomil Balkanski and others -- explain how VMware uses vCAT and how to align VMware cloud infrastructure with a business's goals. The 10 SME-targeted videos explore the documentation center tool and nine areas of the vCAT. The vCAT was created by VMware's top vCloud architects, including John Arrasjid, VCDX #001, principal cloud architect and VMware house band musician. You can watch Arrasjid and former VMware CTO Steven Herrod discuss the vCloud Architecture Toolkit on YouTube. If you're wondering about VMware's band, it's called Elastic Sky. And what is the abbreviation for Elastic Sky (with an X)? ESX. Is your organization considering going down the vCloud path?